First of all, Looney Tunes marathon? Amazing. Best idea ever. I’m fairly certain that there was no rhyme or reason to the arrrangment of the episodes on the DVD’s which made it even better. It’s going to be great when we have kids and can show them Looney Tunes instead of…other cartoons that are…kind of lame these days. I…like I feel like I should have this grandiose introduction to this, but I don’t know what that should be, so. I’m just gonna say it…. DEVON AND I ARE ENGAGED!!! I know Devon and I have been together for a long time, known each other even longer than that and even knowing that I am going to spend my life with this person; it’s still so surreal once the proposal is actually there and the ring is on your finger. 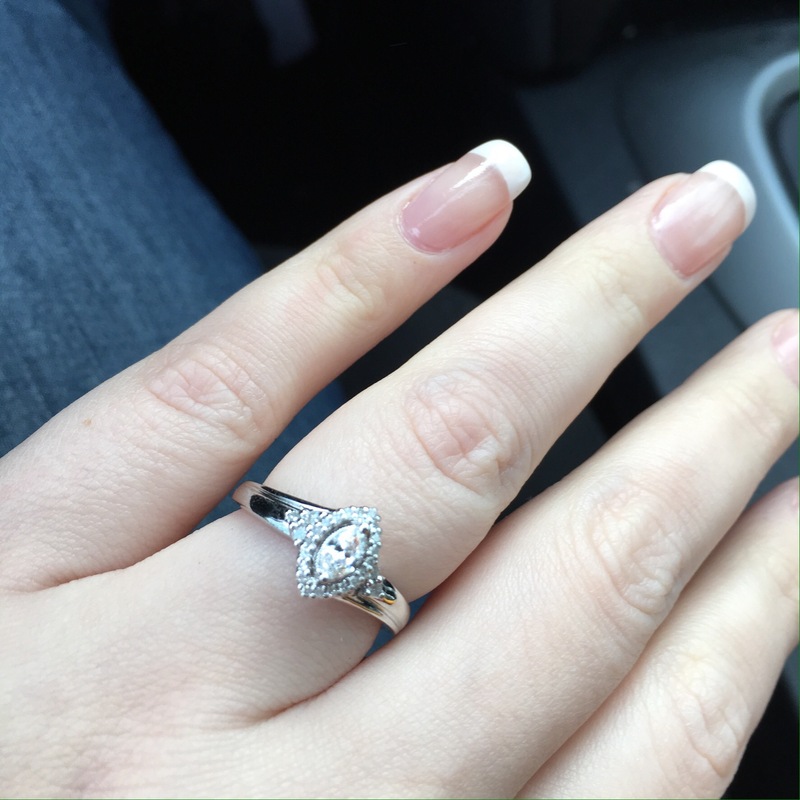 And speaking of the ring….it’s so pretty…..
It’s perfect for me and what I like in jewelry. It’s not over-the-top or flashy. It’s elegant and delicate and I love that it’s unique of what the traditional or “trendy” rings are these days. Not that those aren’t beautiful, but I love that my ring is a little different. And while I am typically someone who takes all her jewelry off when she gets home; I haven’t taken this ring off yet (except to shower). I love it, I just keep staring at it. Andyes, there’s a story, a little bit anyway. Devon’s not the hopeless romantic type. His goal was to always catch me by surprise and have it be this random moment that I would never see coming at that point. He didn’t want it to feel orchestrated or rehearsed, so it was going to always be kind of spur of the moment. So, on Thanksgiving we were getting ready to go to his Mom’s house for dinner. I was doing my normal “routine” that I normally do before I leave the house to like putting my shoes on, selecting a scarf (we know I have a scarf obsession), and all of that. I was by the dresser putting on my jewelry and Devon was standing behind me, looking over my shoulder, watching my motions like a hawk. I get to the final pieces of putting my rings on which are this one cute ring I wear all the time that I’ve had for years and the Ring Devon gave me for Christmas last year. Yes, it was a fake ring, but it was pretty, so I still wore it a lot (just on the wrong hand so less people would ask me if I was engaged). Once the rings are on, Devon takes my hand and takes the fake ring off and switched my other ring to my right hand. Then he pulls a small black box out of the drawer and opens it to reveal the ring inside. I think I stared at it for like 5 minutes just speechless and shaking. Finally, the only thing I can think it say is “is this a real one?” He tells me that it is real and takes it out of the box and places it on my finger. I’m still just staring at it. And I don’t think I let go of him for like 10 minutes after that; partially because my knees were made of jello and if I tried to move, I would have fallen over. But mostly because I was so excited and just floored that it happened. When we were finally leaving the house a little bit later, he told me he’s had the ring since like July and that he was just waiting for a random moment that I would be the most surprised. Despite his constant proclamations that he would “never propose on a holiday or a special day”; I know him well enough to know that him saying that was his way of trying to throw me off, which meant he was going to propose on a holiday or special day. THanksgiving was just not at the top of my list of possibilities there. So, I guess he did get me that way. Our families are both very excited. His grandma cried when she saw the ring and she told me how happy he was that I was “officially” joining the family. I think him proposing on a day where we would see family made it more special because we got to be with people who love both of us. We did the obligatory Facebook status change and post of the engagement once we told the families and the close people first and the amount of love we’e gotten from so many people is wonderful. I know it’s not surprising to a lot of people, but it’s nice to be surrounded by a lot of great people. Obviously, we haven’t really done a lot of planning yet. But we’re thinking of a June 2018 date for the wedding. Partially because we’re both educators, so us doing it during the school year would never happen and partially because we have other friends who are getting married on July 21, 2018, so we want to kind of “out-marry” them. They’re totally on-board with us out-marrying them, too. It’s fantastic. I’m thinking at this point June 30, 2018 will be the date, but not 100% sure of that yet. But that’s as far as we’ve gotten. The next year and a half is going to be interesting! I am officially on my way to becoming a Mrs.!!!! Yay!!!!!! One The First Day of Thanksgiving Break…. Congratulations on your engagement! How special that you were already going to be with so many loved ones the same day.